The following recipe is sufficient to make a very small gingerbread house. If making a larger house or an elaborate construction such as a castle or village, multiple batches of dough will be required. Making at least two batches is recommended so that there will be dough left over for gingerbread men and gingerbread house decorations. Cut out the template pieces and dust them lightly with flour to prevent sticking. Next, cream together butter and sugar. Mix in molasses and eggs. Then blend half the flour with the cinnamon, ginger, cloves, salt, and baking soda, and add to the wet ingredients, mixing well. Add the rest of the flour a little at a time until the dough reaches a consistency that is easy to roll out and shape. Refrigerate the dough for at least 2 hours before working with it. Preheat the oven to 350 degrees Fahrenheit (175 Celsius). Roll the dough out on a lightly floured surface until it is between 1/8 and 1/4 inch thick. Press as many template pieces as will fit on the rolled out dough and cut around them with a very sharp knife (dusting the knife with flour helps to prevent the dough from sticking to it). Use the remaining dough to make gingerbread men, trees, and house decorations. Bake on greased cookie sheets for 10-12 minutes. Remove from the oven, let stand for a few minutes, and then transfer to cooling racks. Don’t attempt to assemble the house until the pieces have cooled completely. When the gingerbread house pieces are ready to use, mix up a batch of royal icing that will act as the glue that holds the house together. Place 1 cup of sugar, cream of tartar, and all 4 egg whites in a bowl and beat with an electric mixer until the mixture is smooth. Add the rest of the sugar a little at a time, mixing for at least 5 minutes, or until thick and stiff. Keep a damp cloth over the bowl to prevent the icing from drying out. 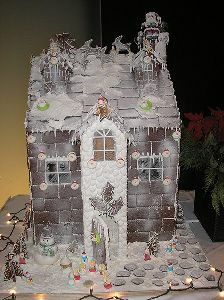 To see photos of gingerbread houses, visit the Gingerbread House Galleries page. For more free Christmas stuff, including gift ideas for people and pets, recipes, and crafts, visit the Christmas page.